John and Charles use sources to understand Agrippa's Rotella and Sword. The use of sources is integral to Historical European Marital Arts and for an instructor it is critical to be aware of your sources, the types of sources and have a means of interpreting them. This week, I'll be covering how the Phoenix Society uses source material. To understand the source material of HEMA you need to know why you need to be familiar with them and what they will and will not do for you. Does reading sources make me a better fencer and will it make my students better fencers? Not necessarily. I have encountered people who are good fencers, able to win tournaments and take on all comers and not read a single thing. An athlete is an athlete. Someone who is tall, fast, agile, and has a good sense of measure and tempo can do just fine at rapier without knowing much about it. Experience is a teacher in of itself. The same goes for every system in HEMA, from longsword, to sword and buckler to dagger and so forth. A person might be naturally gifted, have a great deal of sparring experience, or have a martial arts background and perform well. 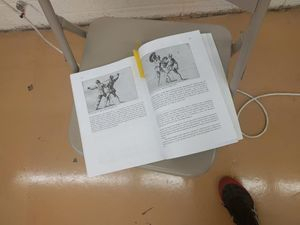 It is also quite natural for the students of a club to be only tangentially familiar with source material, often relying on their instructors to train them. When John and I first started the Phoenix Society we stuffed sources into the hands of our students and they didn't read them. 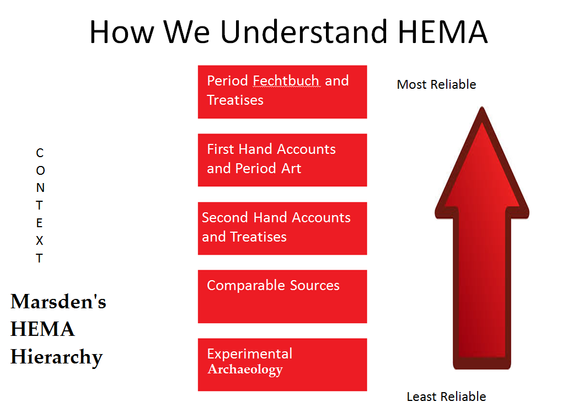 First, we are HEMA and by our very nature we are source based. Anyone I meet who has no interests in the sources does not belong in HEMA. There are many other things they could be doing. I remember at one tournament in particular a fellow showed up to partake in the wrestling. He knew nothing about medieval wrestling, but plenty of what I assumed was jiu-jitsu. He won rather handily. What did he learn? Nothing. What did his competitors learn? Nothing, beyond that perhaps they should go learn jiu-jitsu. If the tournament was about medieval wrestling then that is what should be done and to do otherwise is to miss the point entirely. HEMA by its very nature is source based and those absolutely not interested in it shouldn't be involved. Second, an athlete with no sources and experience can do well. An equally matched athlete who actively reads and studies the sources will do better. In the Phoenix Society we do have guests from outside of HEMA visit. Some of them are skilled at what they do, and they can defeat our more junior students. They have a much harder time on our more senior students who may have been fencing far less than them, but know more technical skills. Third, someone who is not a natural athlete or lacks experience can overcome that weakness with source material. When people first fence me, I am often called some sort of horrific wizard by them. I am thin, I look sickly and yet I can usually handle those who have no source-training with ease. Oh, there have been exceptions, but they are few and far between. The sources have allowed me to do well and when teaching I use myself as an object lesson. I am no Adonis, yet I have many medals, my students have medals and their students have medals. At least when it comes to tournaments, I must be doing something right and I point toward the sources. In HEMA the most common and most valid source is a primary treatises by fencing master. The assumption is that the author knows what he is doing an therefore it as close to the system as we can get. These primary sources can be easy to understand, with clear pictures and text, or more difficult. The Agrippa translation by Swanger is an example of one that is more difficult. Agrippa used single pictures to describe numerous techniques. They are not too hard to discern, but some imagination is needed. Swanger, was kind enough to have a separate page with all of Agrippa's guards displayed so it would be easier for a reader to flip forward and back. Without this, or with smaller images, it would have been far harder. Meyer is another example of a master whose source material can be difficult because of the volume of text and the re-use of the same picture. Yet, other sources are easier to understand. Giganti, translated by Tom Leoni, is easy to read and understand. Giganti's images are clear enough and Leoni's translation is cut and dry with little flowery language. While there is less depth to Giganti than more verbose writers, it is easy to understand. Other sources are more difficult. This is not necessarily the fault of the translator. Leoni, as noted above, is a fine translator. However, his translation of Manciolinio is much harder to understand. Why? The master was verbose and there are precious few images to use as a guide. Taking sources and trying to figure them out is the bread and butter of HEMA. Some sources have pictures, some do not, some are clear in their instructions, some allow for interpretation, some are lacking any instruction at all beyond a few phrases. 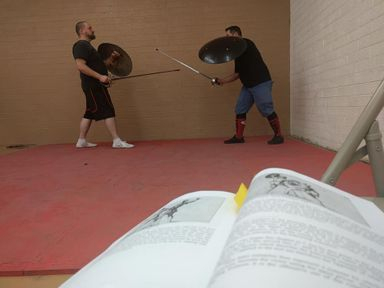 When studying HEMA you should strive to read the primary source material whenever possible and build upon it by looking at related fields. Reading Meyer's 16th century longsword is fine, reading it and looking at early KDF longsword is even better. Reading Giganti's 17th century rapier is fine, reading Giganti and Fabris, a contemporary, is even better. If there are no primary sources available, there are other means of learning HEMA. Polish saber of the 17th century existed. We know it existed because the Poles reference it in their writing and sources outside of Poland also refer to it. What we do not know is what exactly Polish saber fencing looked like. 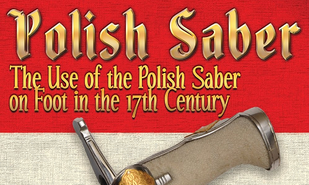 There are no primary treatises of 17th century Polish saber. To try and understand Polish saber fencing I wrote a book on the subject tilted cleverly, Polish Saber. My book uses the sources available to reconstruct a plausible and source based system. 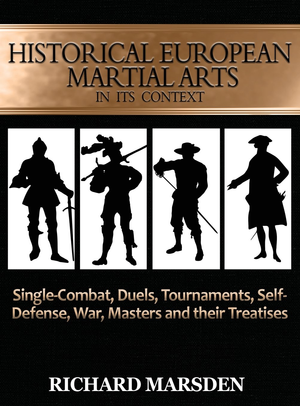 This includes, 19th century Polish saber fencing, of which we have a partial treatise, German and Italian sources from the 16th and 17th century, first hand accounts and more. Putting this all together gave me the means to create a system and be fairly confident it was on the right track. Without a primary treatise, I will never know how 'close' my reconstruction is. This is not unusual. Most of your early understanding of Roman history likely comes from one single source, Livy, who wrote hundreds of years after the fact. Using Livy and other sources and archaeology gives historians a mean to validate or discredit Livy and today historians still make a living mulling over Livy and his interpretation of Roman history. The less sources available the less accurate the reconstruction is. For example, those trying to recreate Viking arts have very few sources, so few, that various reconstruction groups look worlds apart because they have no core basis of writing to work from. Many interpret the Viking arts by picking up a sword and shield and making reasonable, but possibly inaccurate, assumptions. 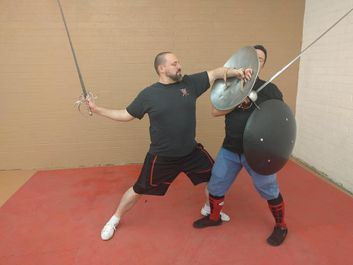 The least effective way to understand HEMA is to pick up a weapon and fight with it. The reason why is you could end up getting very good and yet not using the weapon the way it was done historically. If we are to be HEMA then we need to try and use the history and our sources as our guiding light. When I study sources I use this hierarchy to validate what I do. Primary treatises, like Fiore's Flower of Battle is at the top. A book like my Polish Saber would be in the middle. And at the bottom would be people who just come up with plausible ideas based almost entirely off theory. Like this gem. Knowing where you sit on my reliability scale can help you improve your HEMA. If you are near the bottom, get more material from the top. In my own experience I could have written Polish Saber purely based on how I felt a saber works. Instead, I have sources filling the book to make a better case for my reconstruction. You will notice that off to the side is context. Context is the hidden part of HEMA that many instructors miss. Why were the source materials written? What was the culture of the time? In what context did the masters exist? I wrote a book for just such an occasion! The HEMA in its Context book provides you with the cultural information often missing from the study of HEMA. The history behind the sources gives you a better understand of HEMA. What were duels exactly? Were they legal? What about self defense? Warfare? Guilds and schools? My book covers a broad range of topics and its purpose was to give the community a nice looking book that helps them with their HEMA studies, filled with anecdotes that we teachers love to use to hook our audiences. Finally, Wikteanauer is a free service that has translations of numerous systems available as well as the art. Every year the virtual library grows and it is the go-to I use whenever I quickly need to look into a source. This is a two-part article. Today we covered how the sources are valuable, why they are valuable and how I scale them from least reliable to most. I also pitched quite a few books, so please check them out as well as Wiktenauer. Next week I will cover how to take a source and understand it using examples from numerous treatises, ranging from the quite easy to the difficult. AS ALWAYS, THANK YOU FOR THOSE WHO PURCHASE BOOKS FROM TYRANT INDUSTRIES. YOU AND ONLY YOU MAKE THESE ARTICLES POSSIBLE THROUGH YOUR PATRONAGE.